A West Midlands healthcare Trust will burst the bubble on sugar-packed fizzy drinks by backing a national campaign. 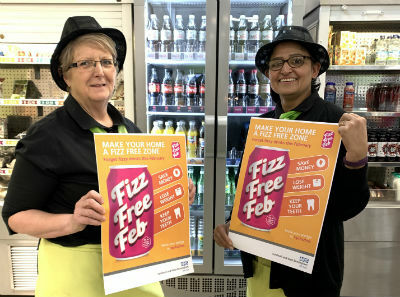 Sandwell and West Birmingham NHS Trust is supporting Fizz Free February by urging patients, staff and visitors to ditch sugary drinks for 28 days. The campaign is a great way to reduce intake of the substance and is the brainchild of Southwark Council. It is also being supported by the Labour Party’s Deputy Leader, and West Bromwich East MP Tom Watson, who recently revealed his battle with diabetes. Sandwell Council is also asking residents to sign a pledge committing to go fizz free for the month of February. Dr Nick Makwana, Consultant Paediatrician, spoke about the link between obesity and sugar consumption. He said: “Through my work I know that one in five children are obese when they hit primary school, whilst one in three are when they reach secondary school. “We also know by 2020, 50 per cent of our children will be obese. I know that obese children are stigmatised and bullied more and are also absent from school, which affects their education. “As they get older they have pre-diabetes issues and bone and joint problems. As they move into adulthood they are more likely to suffer heart attacks, high blood pressure and strokes. Dr Derek Connolly, Interventional Cardiologist explained: “This initiative is a great idea, because we know that sugar is a risk factor for heart disease and stroke. Latest data Public Health England on the nation’s diet shows that sugar now makes up 13.5 per cent of four to 10 year-olds and 14.1 per cent of teenagers daily calorie intake respectively, while the official recommendation is to limit sugar to no more than five per cent. To sign Sandwell Council’s pledge, click here. For more details on Fizz Free February, go to https://www.sugarsmartuk.org/news/fizz_free_february_2019/.